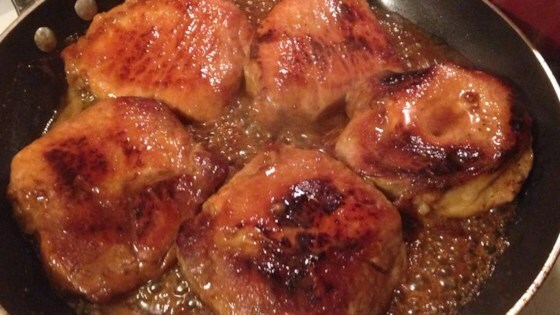 "Pork chops with a sweet glaze. My grandkids love this as do their friends. If your family prefers you can spice it up your way, my family likes it as is. Great with either mashed or sweet potatoes." Heat a large skillet over medium-high heat. Brown the pork chops in the hot pan, about 4 to 5 minutes per side. Pour in the apple juice and maple syrup; reduce heat and simmer until the juice has reduced and thickened slightly. Cook until the pork is no longer pink in the center. An instant-read thermometer inserted into the center should read 145 degrees F (63 degrees C). My wife and I thought these chops were excellent made jsut as the recipe said came out great! i made it in the slow cooker instead, and it was delicious. Very Tasty, Do not over cook your porkchops. I will make again. Very easy to make, I would say 7 out of a 10.